We get a lot of questions from readers about converting PDF to MS Word doc, and converting MS Word docs to PDF. Newer versions of MS Word (and most word processing programs in free office programs) and open PDF files and save them as Word Docs. 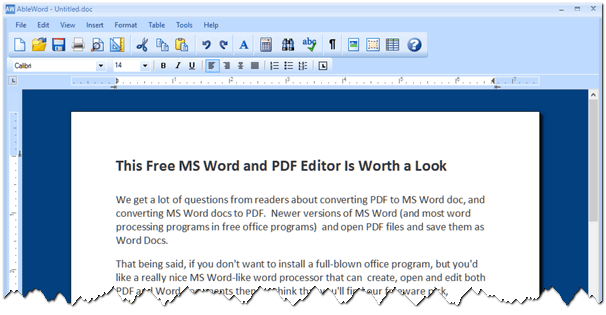 That being said, if you don’t want to install a full-blown office program, but you’d like a really nice MS Word-like word processor that can create, open and edit both PDF and Word documents then we think that you’ll find our freeware pick, AbleWord, worth a look. AbleWord is a very capable word processing application that can read and write most popular document formats including PDF’s. It is fully featured, supporting image formatting, tables, headers & footers and includes spell checking and print preview functions. Best of all it is totally free even for commercial use. 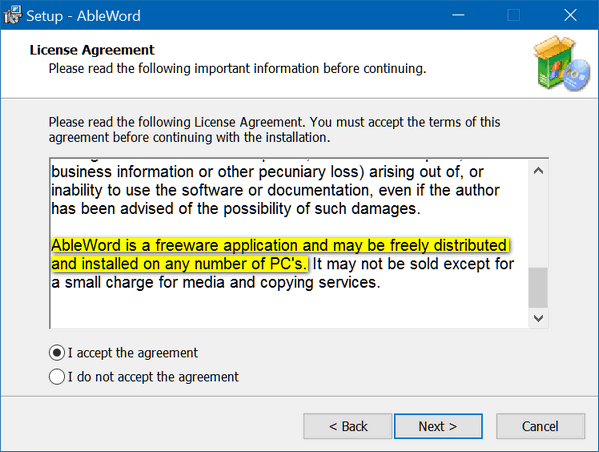 AbleWord (is) very simple to install and use, it is commonly used as a PDF Editor and also for converting PDF to Word® but of course it is also a splendid Word processor and supports most of Microsoft Word® features. We found AbleWord very easy to use. The PDF editing function works well on some PDF files, and so-so on more complex files. It’s not a professional PDF editor like Adobe Acrobat Pro, but then again it doesn’t cost hundreds of dollars. It’s 100% free. You can read more about, and/or download it from the AbleWord Web Site. Here are some screen shots from our installation and testing of AbleWord. 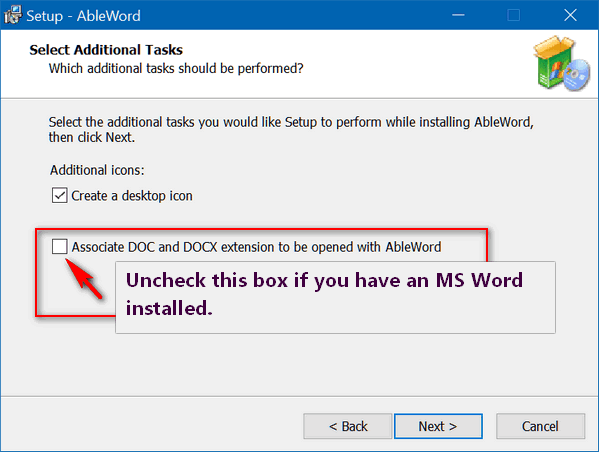 Above: No malware or tricks, but AbleWord does associate itself with MS Word DOC and DOCX, which is great if you don’t have MS Office installed or some other Office program that handles DOC and DOCX formats. If you have MS Office or another office program installed, you might want to uncheck the box as shown in the screen shot above. AbleWord looks great. It has a nice, almost quaint but functional, easy-to-use interface. Below: You can save and edit file types shown below. If your looking for a free, functional, easy-to-use Word processor that can edit both Word documents and PDF files, then AbleWord might be just what you’re looking for. AbleWord sure seems to be quite remarkable. However, does it also work on PDF to XLSX? If not, is there perhaps a program available that will do so? You’ll find at least a half-dozen or more programs and Web sites that claim to do the conversion with accuracy. Some are free, some are not (Acrobat). We have not tested any of these sites and/or software, so be wary… especially if it’s free. Here is a video that shows how to convert PDF to Excel (XLSX) without any software, but I’d be surprised if this works. The short answer – no AbleWord does not create, open or covert spreadsheet formats. I have tried quite a few free word programs, but this one works really well, and the ability to load and edit pdf is amazing. Many thanks. Exactly what I’ve been looking for as I lost my MS Word in computer crash. Thanks. Thanks so very much for this. I have downloaded it..
Love all the wonderful things you find for us. I use Emsisoft at home but at work I use Vipre as my virus protection and Vipre is preventing the link from displaying that website, and it very rarely, if ever, prevents me from going to any webpage. Are you sure it’s safe? Thought I better check in case something changed from when you posted this. Thx. Thanks for your comments. We want to caution anyone reading this that WinZip is a known software bundler. Their software may come bundled with unwanted software, browser & search engine hijackers, and possibly malware. 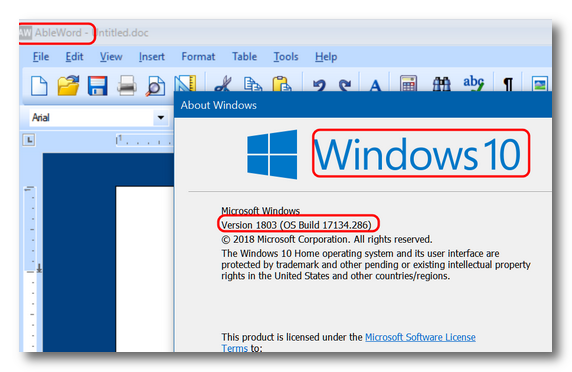 Windows 10 users don’t need any 3rd-party programs to save any files as PDF. My Malware Bytes will NOT allow me to go into this Ableword site. It said it is unsafe, and since I have just lost everything to some nasty thing in my computer, I won’t be downloading that. I thought that perhaps you would like to check that site out since you are recommending it. Probably was ok when you tried it out. The problem now is that I am trying to find a free word processor and I thought this would do nicely. Darn. According to VirusTotal, Malwarebytes finds no problem with it and neither did 62 other security programs. But it doesn’t surprise me. Malwarebytes as has its share of problems – I would never rely on it. 63 Security programs found AbleWord to be clean – 3 off-brand security program identified a “Generic Trojan”. Generic Trojan is poppycock for “False Positive” or “We don’t know what it is”. You can read VirusTotal’s scan of AbleWord here https://goo.gl/xXBTuv. I would sure not change our recommendation based on something Malwarebytes shows anyway. AbleWord is still fine. But it’s your choice- can choose not to use it. But we find no valid reason to rescind our recommendation. By the way, I did test it again today 2/2/2018 and it’s still a nice program. 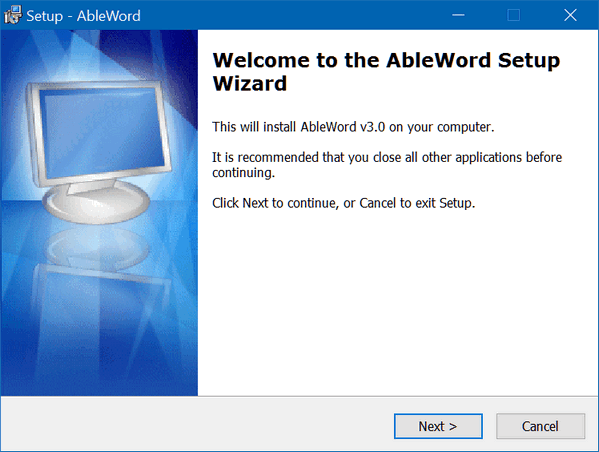 I have been reading many reviews about Ableword on the web, as well as visiting their page. Some sites claim it only works through Windows 8, others include Windows 10. Apparently the last version is 3.0 and was released BEFORE Windows 10. 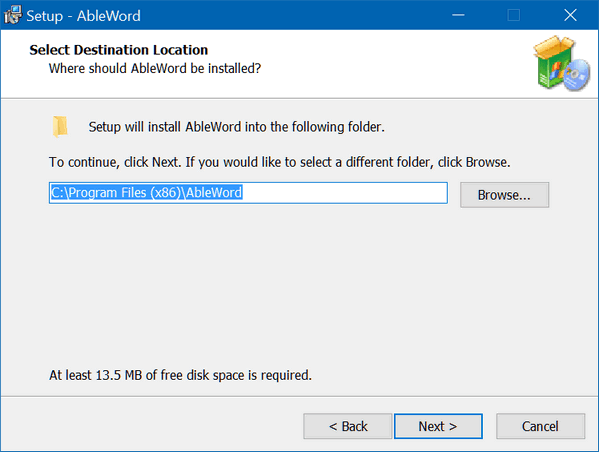 Since this page has been updated in 2018, would you please let me know if Ableword does work properly on Win 10? Thanks! The .Net Framework which is required by AbleWord is inclided (sic) with WIndows (sic) Vista and Windows 7. If needed then Windows 8 and 10 will prompt you and automatically install for you.